Safety of both employees, clients and other people who may move through a place of business on a regular basis is always of the utmost concern regardless of the industry that business happens to be operating in. When it comes to the construction industry, however, proper safety rules and regulations become exponentially more important as even a slight mistake can have potentially devastating consequences. 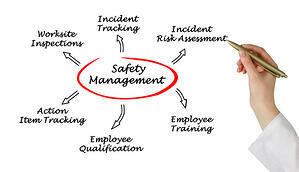 Safety Management Systems, also commonly referred to by the acronym SMS, were designed in part to help manage the various safety elements in a workplace and create a much safer and more secure environment for everyone involved. All high quality Safety Management System deployments have a few key components. Tools that allow for the establishment of policy measures. Organizational tools that allow for the sharing of information and more. Tools designed to help with the planning and implementation of certain safety measures. Tools designed to evaluate the effectiveness of existing safety measures. Tools designed to present actionable data that can be used for safety improvement moving forward. As the name suggests, these policy tools are designed to allow decision makers within an organization to establish definitive statements regarding the organization of resources, the commitment of management and certain objectives that will be completed regarding facility safety on a regular basis. In essence, they are a way to put in writing the steps that will be taken to create a safe workplace for all employees. Organizational tools available in an effective Safety Management System deployment allow for decision makers to define responsibilities, give accountability to certain members of the organization and more. In the event of a crisis, these tools can be used to determine which employee is responsible for which actions as part of a crisis management plan. Planning and implementation tools available in Safety Management Systems allow for those in leadership positions to easily reference laws, legislation and certain governing standards that apply to the organization as a whole. Not all laws regarding safety will apply to every business, for example, as a significant amount of variables are involved. Planning and implementation tools both allow those people to see the rules that apply to the organization specifically and review methods of hazard prevention and risk assessment techniques. Evaluation tools are one of the most important elements of any Safety Management System, as they help define how safety performance is measured and graded. These Evaluation tools can help create methods for reporting incidents, the investigation into the cause and result of certain types of accidents and more. They can also be an invaluable resource when it comes to how reviews are conducted regarding existing crisis and accident management procedures. Tools regarding areas of improvement that are available in effective Safety Management Systems are just that - utilities that can be used to take existing practices and improve their overall effectiveness moving forward. An unfortunate fact of the matter is that no safety protocol is 100% infallible. With these types of tools and the Safety Management System as a whole, people in leadership positions within an organization can easily see exactly what steps are currently being taken to create a safe work environment or handle accidents and can also review actionable information regarding the way these methods can be improved even further. When all of these elements are in place and are operating at peak efficiency, the construction organization in question is able to more easily meet both its legal obligations for employee safety under current laws and take further steps to create the safest environment possible for everyone involved.